Switzerland has been noted as a cheese producing country for many years, and in the summer many of the dairy herds are taken into the mountainous regions and are grazed on the abundant pastures and meadows that result from the heavy rainfall. Cheesemakers and caretakers of the cattle accompany the herds to the mountains during the summer months, but as fall approaches, the cattle are returned to the lower lands where they are stabled or housed for the winter. During the Middle Ages the land of Switzerland was under the feudal system, and agricultural improvement was not marked. After the turn of the 19th century agricultural conditions in Switzerland were much improved; lands in many of the 22 cantons (similar to states) of Switzerland were put under fence, and crops of turnips, beets, and improved hays were introduced. This decidedly improved the feed supply available for cattle, and interest was aroused in breeding cattle that were more productive. Improvements in cheese manufacturing that were made about in 1825 created a market for an increased quantity of milk. 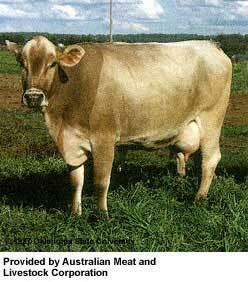 Brown Swiss cattle, therefore, first became prominent among dairy breeds about a 100 years ago. The exact date when this fashion arose is not certain, but it was at some time in the first half of the 19th century. The Brown Swiss breed in the United States was declared a dairy breed in 1906, and in 1907 a classification for Brown Swiss was provided at the National Dairy Show. Many writers have suggested that the breed is centuries old and that little crossing with other breeds has been done for hundreds of years. As is the case in the origin of the other breeds of livestock, this conclusion seems to be more romantic than correct. The Pinzgaur breed, which is apparently a native of Austria, seems to have been the breed from that country that was used in the improvement of the Brown Swiss. The predominant cattle of Schwyz in about 1860 were of a chestnut to a dull black color, and most of the cattle were darker on their fore- and hindquarters than of their bodies. Many of them carried a light-colored or light grayish stripe down their backs. This variation of color pattern was apparently introduced from the Pinzgau, and the Brown Swiss of the modern day seem to have acquired the light dorsal stripe from these cattle brought in from Austria. Since no records of the breed were maintained for a good many decades after the formation of the breed, it is altogether possible that other cattle could have been used in the improvement. Direct evidence of such crosses is lacking. Breed Activity in Switzerland. There has been extremely little promotion of the Brown Swiss breed in its native country although it has been exported to Russia, Italy, Germany, the United States, and many other countries where it has gained a very favorable reputation. Herd Books for the Brown Swiss did not appear in its native land until 1911, although such a Herd Book has appeared 20 years earlier in the United States. Such breed promotional activities as are carried on the Switzerland are largely under the auspices of a government subsidized association that sponsors shows and sales of purebred livestock. A Brown Swiss Cattle Breeders Association, which was organized in Switzerland, has been active in promoting shows and in the production testing and classification of the breed. The first Brown Swiss cattle were brought to the United States in 1869 by Henry M. Clark of Belmont, Massachusetts, who visited the canton of Schwyz and secured a bull and seven females from Col. G. Burgi of Arth, Switzerland. When the Brown Swiss Cattle Breeders Association was organized, the bull was registered as William Tell 1, and the females were registered as Zurich 1, Lucerne 2, Gretchen 3, Brinlie 4, Lissa 5, Christine 6, and Geneva 7. These cattle were subsequently sold to D. Hall, Providence, Rhode Island, and D.G. Aldrich, Worcester, Massachusetts. In 1882, Scott and Harris, Wethersfield, Connecticut, imported 19 cows, and in 1889, George W. Harris of the firm established a purebred herd later operated by his sons, George M. and Rodney W., of Wethersfield, Connecticut. Five other importations within the 10 year period following 1882 included those of L.J. McCormick, Chicago, Illinois; William Koch, New York, New York; J.C. Eldridge, Middle Falls, New York; E.M. Barton, Hinsdale, Illinois; and McLaury Brothers of New York. 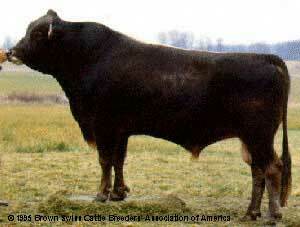 A notable importation of the breed was that in 1906 by E.M. Barton who brought 34 cows and five bulls to this country. One of these was the bull Junker 2365, dropped in 1904, which became Grand Champion at the National Dairy Shows in 1907, 1908, and 1909. He sired daughters that made excellent production records and had a very important influence in the breed.2 In 1906, importations were stopped because of foot-and-mouth disease, and only three cattle have been brought from Switzerland since that date. 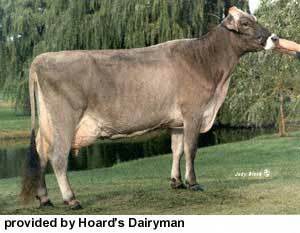 There has been a total of only 155 head of Brown Swiss brought form Switzerland and recorded in the Herd Book in this country. A very steady growth of the breed from this very meager beginning has been most gratifying to those sponsoring the development and improvement of the Brown Swiss. 1 E. Parmalee Prentice, American Dairy Cattle, Harper & Row, Publishers, Inc., New York, 1942. 2 Dorsa M. Yoder and Jay L. Lush, "The Genetic History of the Brown Swiss Cattle in the United States," Journal of Heredity, 28(4), 154-160, 1937.